Browse Through Our Content Marketing Resources! Simple Marketing Now's tip sheets, guides and articles get to the essence of what you need to know about a specific online marketing topic so you can get started. In this case, Content Marketing. Effective content marketing connects with readers and visitors. It educates, it builds trust, it reflects your voice and personality, it helps you develop a relationship. It is content you create for your website, your blog, your social media networks, and which you use in marketing materials, presentations and communications shared offline, too. See our case studies for examples of blogs and content marketing in action. Simple Marketing Now's 'Get Started' Guides start with the tip sheets and go into considerable more detail with tips, best practices and examples. 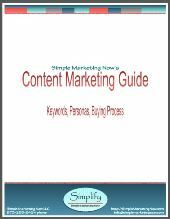 The Content Marketing Guide is detailed below. Click on the link, and scroll down to browse through Content Marketing articles we've included in our Resource Library. Keywords, Personas and the Buying Process in this 12 page guide. Click on Content Marketing Guide to download your copy and learn more. Simple Marketing Now's Guide to Growing and Scaling Your Business Blog describes how to ensure that your busines blog fits into your overall business strategy in this 22 page business blogging guide. Click on Guide to Growing and Scaling Your Business Blog to download your copy and learn more. By the way, if you spend a great deal of time thinking about your customers, you may find the following resources of interest as they capture the notion of 'walking' in your customers' shoes. 10 Tips for Marketing & Selling to Women. If you're looking for additional resources, check out Marketing and Selling to Flooring/Stone Power Consumers: Download Your Resources! created for Surfaces 2012. Also read Flooring the Consumer, the original Flooring the Consumer and articles published on Floor Covering Weekly. 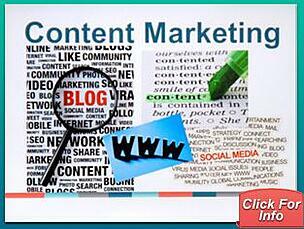 You might also explore the Content Talks Business Blog.